I love our girls. We have six of them – Henrietta, Matilda, Bella and Ella, Althea, and Betsy. Though we suspect Betsy may be a male. I’m talking about my flock of hens (and potential rooster), of course. We got them on Easter weekend, as people do, when you have a million reasons not to get them, but you can’t resist the allure of a sweet fuzzy chick cupped in your hand and the prospect of fresh eggs down the line. Here we are a few months later, and those fluffy chicks grew faster than the weeds in my backyard into pullet hens. Pullet hens – hens younger than a year old – look almost full-grown, and will start producing eggs at around six months of age, so sometime in the late fall. I can’t wait to make my first omelet. 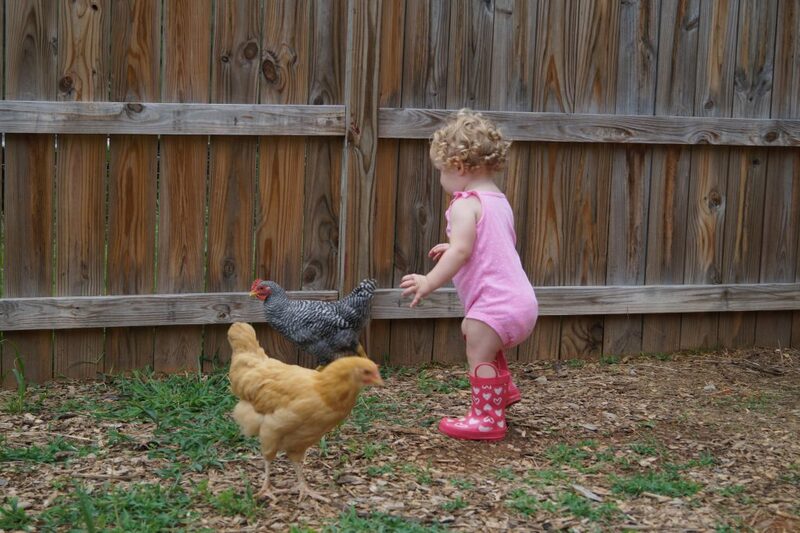 My pullet hens are pretty adept at avoiding my toddler. My 6-year-old is a bit gentler with them. My husband and I aren’t farmers. We aren’t hipsters, and we don’t fall into any of the stereotypes you might think of when you think about people who keep chickens. Backyard or urban chickens have become more common over the past decade, and for good reason. You can’t eat any more local or sustainable than eggs straight from your yard, and many sources say they are more nutritious and tastier than ones from the grocery store. It’s also an excellent way to teach children about animals and nutrition, and to get them outside away from electronic screens. And hens can provide excellent fertilizer and pest control for your garden. This beauty was one of the hens on the tour. 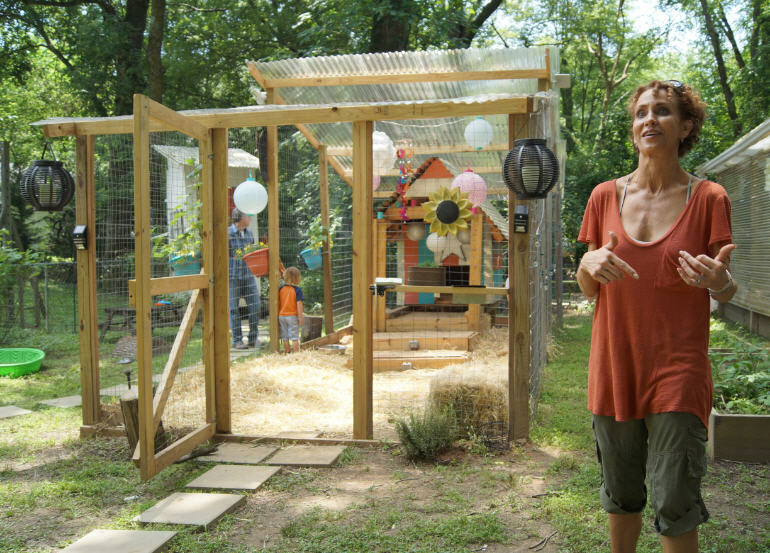 I recently went on the Tour d’Coop in Raleigh (BCBSNC was a presenting sponsor), an event where you can scope out other people’s chicken coops and learn the ins and outs of urban chicken keeping. It was a fun event, the best part being that proceeds benefit Urban Ministries of Wake County. Through tour sponsorships, ticket sales, and donations, Urban Ministries raised more than $26,000. Please take a look at their website to find out more about their good work. In short, money from the tour will provide nutritious food for the hungry, medicine and healthcare for the uninsured, and a pathway home for homeless women. Bev Norwood, one of the Tour d’Coop founders. Since then it has grown to an annual event that has generated income for Urban Ministries to do their good work, and annually leads flocks (sorry, I couldn’t help myself) of people to raise chickens of their own. More than 1,000 people went on the tour this year. There were 21 stops on the tour, and my husband and I checked out a few whose descriptions were especially appealing. Our first stop was at a beautiful Five Points home, complete with gardens, beehives and 12 hens. The owners, Christian and Connie, were part of the original tour and have had chickens for 11 years. Heather Eberhardt shares her tips and tricks. 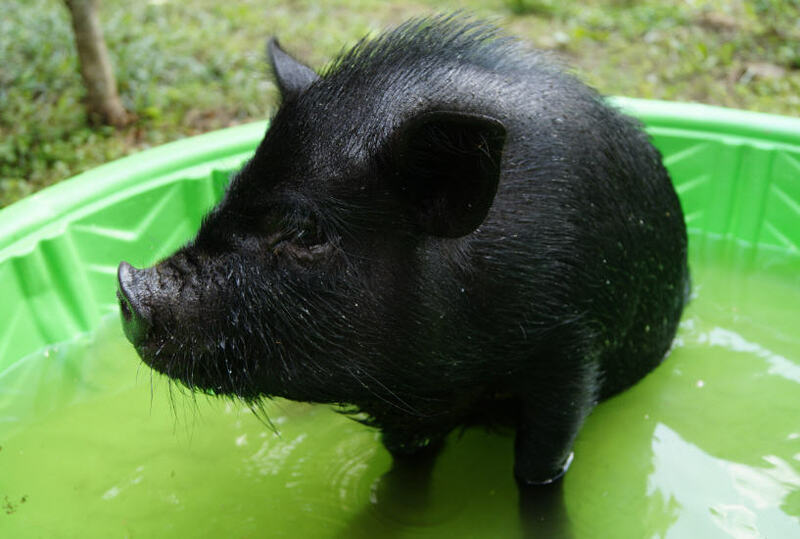 On another stop, we met Amelia, the pot-bellied rescue pig, as she enjoyed a refreshing bath in a kiddie pool. This stop also had beehives, gardens, 10 hens and a rooster, and a Myotonic (“fainting”) goat. The pot-bellied pig’s owner, Heather, said they started raising chickens when her 6-year-old son was an infant. A vegetarian and obvious animal-lover, she said, “I wanted to show him that this is what animals do for you, and to help him learn a healthy respect for animals.” She also said having so much to do outdoors has minimized her son’s screen time. Amelia the pot-bellied pig, enjoying her bath. Another coop owner, Justin, talked about how each of his hens, “Has a unique personality.” When I asked him who his favorite hen was, he glanced at the coop so as to make sure none of the hens were listening, and told me it was a tie between Yolanda and Victoria. For the record, my favorite hen in our flock is Matilda (or Tildy, as we call her). 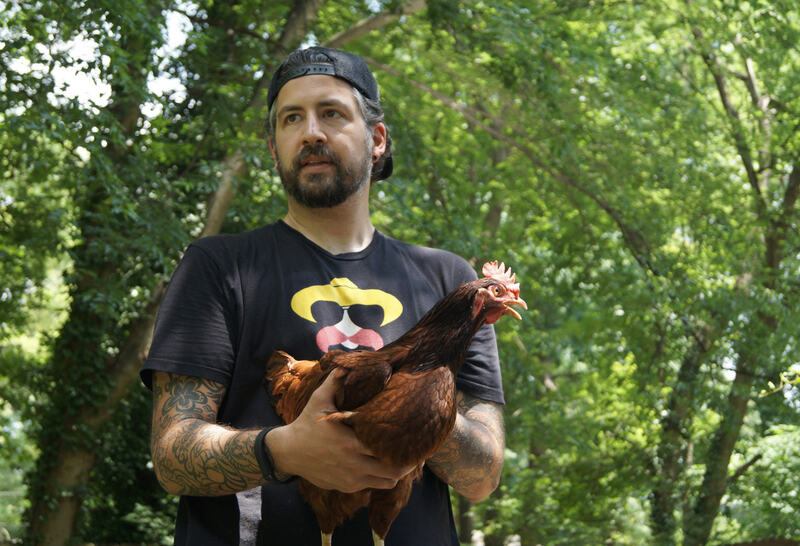 Justin Miller and one of his hens. 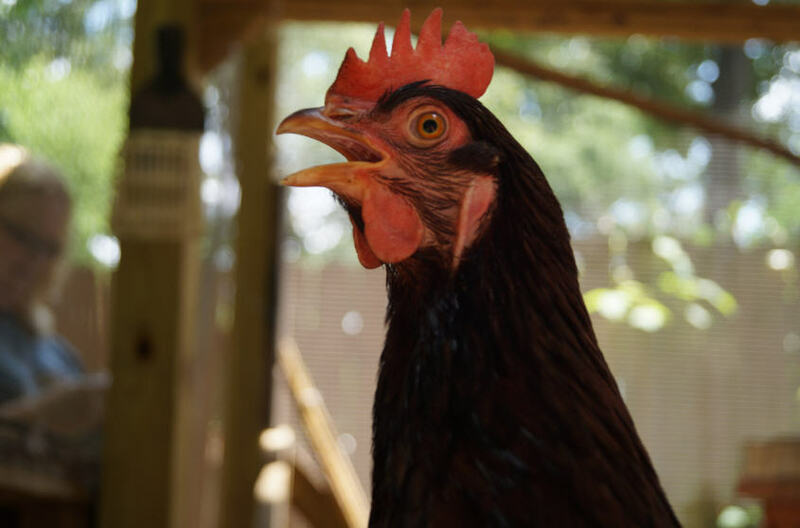 I’m not trying to sell you on the idea of raising chickens – there is definitely cost, time, lots of poop, and daily maintenance involved, and you’ll want to approach the decision the same way you’d think about adding a new pet (or six) to your household. 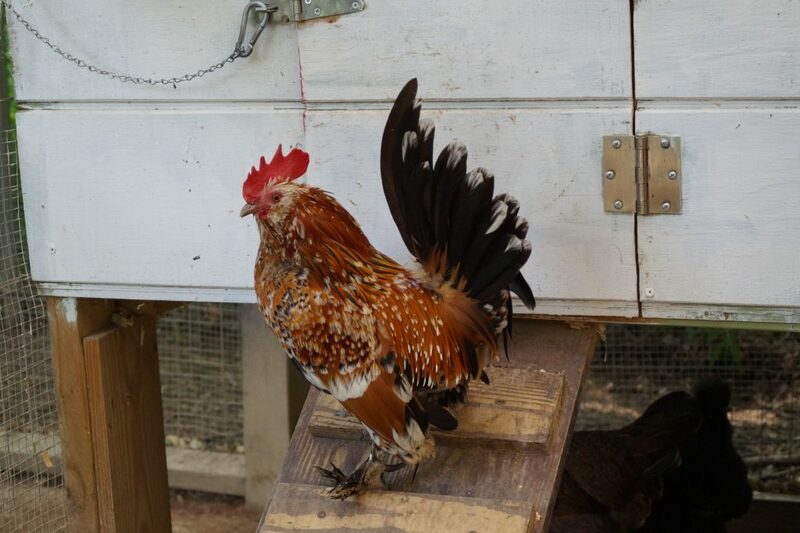 Ms. Bojangles is a sweet Rhode Island Red. 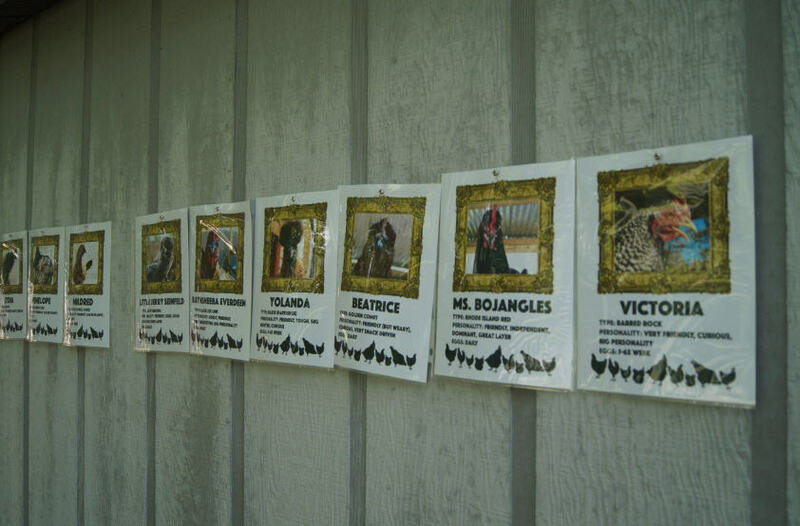 There are about 65 breeds of chickens. But if you’re thinking about it, do your research, check out the ordinances for your county, and get fully prepared before you find yourself staring beak to nose with an irresistible fluffy baby chick. The health benefits of fresh eggs, and the mental health benefits of having these feathered friends are worth it. I’ll let you know how that omelet tastes this fall. 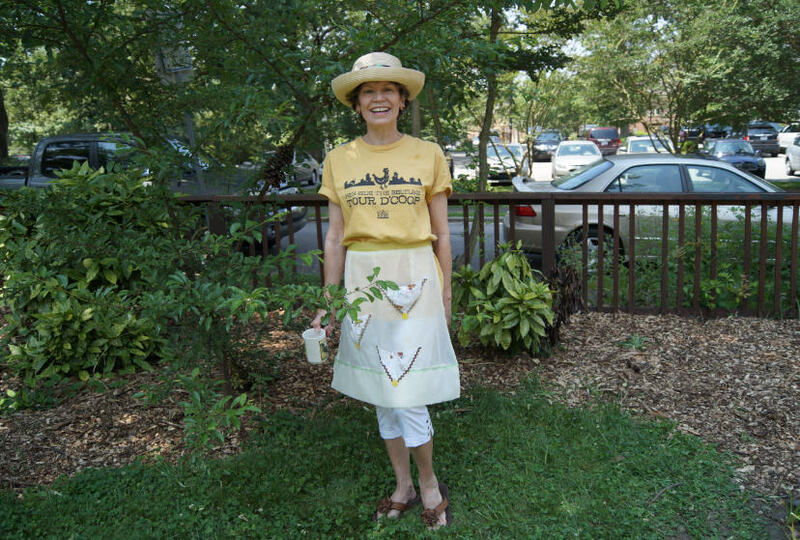 Tips from Bev Norwood, Tour d’Coop co-founder. Have your coop built and supplies before you get chickens. A super secure coop is a top priority. It is not as much to keep them in as to keep predators out. Build the coop so that you are able to clean it easily, sanitation is important. 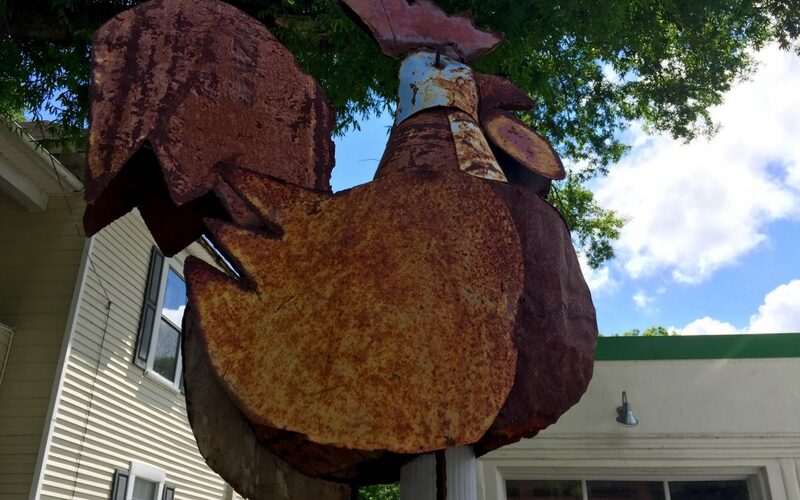 Chickens are legal in the Raleigh city limits but check with your subdivision/neighborhood, there may be restrictive covenants that do not permit them. Enjoy them! They are a joy to have and watch. Tips from Bob Davis, Tour d’Coop co-founder. 1. Keep the water clean. 2. Keep the food dry. 3. Keep your chickens out of the mouths of predators. 4. Start with a low number and never crowd them. 5. Free range (without a fence or supervision) is the most dangerous thing you will ever do with your chickens, and if you have close neighbors, perhaps the most inconsiderate. Clafouti, a baked pudding, is a French country recipe. It is our favorite way to celebrate an abundance of eggs. It is delicious for dessert with some whipped cream or ice cream or perfect for breakfast or a snack. It is ridiculously easy to prepare as well, which adds to its appeal! 1 T vanilla, 6 eggs, 2/3 cup sugar, 1 ¼ cup milk, 2 T kirsch, Pinch salt, 3/4 cup flour, 3 cups fruit, Butter (and sugar, if desired), A 10 ½ inch baking dish or pie plate. Butter (and sugar, if desired) a 10 ½ inch baking dish or pie plate. Preheat the oven to 400. Arrange the fruit in the prepared baking dish. Put all other ingredients in the blender and mix well. Pour over fruit. Bake until the batter is firm and golden, about 30 to 35 minutes. It will pop up at first and then settle back down. The baking time depends greatly on the depth of your baking dish – you’ll need to keep checking after about 25 minutes to see if the top is done.